I’d been on the fence about going at all. Richard Thompson, the veteran British folk rocker, was coming to town, and for the first time in my memory, I didn’t have a ticket. I’d converted my dad into a Thompson fan early on with a steady application of mix tapes. My brother and I once took a road trip deep into the heart of Maine to see Thompson play. It was a tiny theater hours from the closest city, but it had as diverse and enthusiastic an audience as I’ve ever been a part of. The next day, my brother and I turned his pickup around and saw Thompson perform again six hours away in Salem, Mass. After a lifetime of my mom sharing her love of live performance with me, I’m pretty certain seeing Thompson in Tarrytown, N. Y. was our last time sitting together in an audience, our attention pinned to a stage. But last fall, when a double bill was announced with Richard Thompson and Loudon Wainwright III at the Calvin in Northampton—the Loud & Rich Tour—it appeared I’d exhausted my supply of friends and family willing to join me. My dad, who lives in Australia now, had seen the two play together in Brisbane a few years ago and had only positive things to say about the pairing. But even this ironclad endorsement wasn’t tantalizing enough to hook anyone stateside into going to the show with me. I was starting to wonder if maybe taking a break myself wouldn’t be a bad idea. But then the night of the concert came, and my wife, finding me growing increasingly fidgety and grouchy as the hour approached for the curtain to rise, suggested I go alone. I doubted I’d get a seat, but I got the hint. With only 10 minutes to go, I jumped in the car and, miraculously, I found a parking space a block from the theater. I let the guy in the box office talk me into upgrading from my initial plan for a nosebleed seat. I sank into my place a few rows back from the stage just as the house lights fell, and as I marveled at my good luck, Wainwright stepped to the microphone, ukulele in hand. Having a beer afterwards at the Dirty Truth, I emailed my dad and confirmed his initial observations. Thompson’s chemistry with his longtime friend added flavors and layers to the performance I hadn’t yet enjoyed. In the past six months, both artists have released albums with some of the new material I heard at that concert almost a year ago. Wainwright’s 10 Songs for the New Depression was released in March of this year, and earlier this month, Thompson offered up 13 new tracks on his release, Dream Attic. Both albums are the best material either artist has put out in years, and listening to them makes me grateful I braved going to the show alone. I’ve already got my ticket for October 27, when Richard Thompson returns to the Calvin with his band. Unlike his many previous albums of new material, Richard Thompson’s Dream Attic is a live album. As a compilation of the best takes from a series of performances delivered on stages earlier this year by Thompson and his four-man backing band, it captures the intensity, complexity and lavishness of his shows. Instead of trying to cram all he has to offer into the standard three-minute, radio-ready rock song format, Thompson stretches his legs on this album, filling a CD to the brim with new music; with one exception, all songs are well over four minutes and several come in around the seven-minute mark. If the idea of such extravagance stirs up bad flashbacks of being stuck in a van with a gaggle of Dead Heads or Phish phans and being subjected to apparently endless cassette tapes filled with self-indulgent guitar noodling, the infinite repetition of a chorus that wasn’t much good the first time, or the water-torture-like experimentation of a devoted but stoned musician working out the unlimited variations of deedily-deedily-deedily-deeeee—banish them. Thompson’s songs are genuinely complex, and his guitar work is as eloquent and detailed as his exquisitely dark and somber lyrics. His guitar solos, for which he is renowned, don’t spin around one theme or loiter without purpose. They travel and develop as they build. They can be sharp, wicked and racing, but when he takes his time and paints the air in his dark, shadowy guitar work, his powers are at their height. He could make Poe weep. Many such solos are the backbone of Dream Attic. There is nothing sloppy about the album, and often the audience’s applause comes as a surprise, waking you from the enchantment his songs cast. Thompson has long been a kind of Edward Gorey of rock and roll. Even in his teens, as a founding member of Fairport Convention in the ’60s, Thompson showed a flair for the bittersweet and downright miserable. Though he penned many of their songs back then, he mostly stuck to the guitar when they played, as he had vocalist Sandy Denny to express the depths of sadness his lyrics touched. Throughout the ’70s, when he performed with his wife, Linda, the two produced a few songs of giddy romance (including his one official hit, “I Want to See the Bright Lights Tonight”). But their finest songs, such as “Dimming of the Day” or “Walking on a Wire,” were all particularly pensive. In the early ’80s, after he had separated from his wife and embarked on a solo career, his fan club issued a collection of his outtakes and rarities entitled Gloom and Doom from the Tomb. All through the ’90s and until today, his most requested song remains “1952 Vincent Black Lightning,” which tenderly tells the story of a love triangle between a man, a woman and a motorcycle. It ends violently. Far from coming across as a Vincent Price on stage, though, Thompson is all gentleman—polite and charming—but with a rebellious twinkle in his eye. Playing an acoustic show alone or with a full band behind him, he’s there to have a good time and give it all he’s got. Even with the largely grim repertoire, he keeps things upbeat. When he’s not describing characters from his well-stocked rogue’s gallery—such as a poor, naive “ditching boy” who is always the unwitting victim, or Sam Jones and what he does with bones he collects—Thompson’s rocking out. As with many of his records, there are a fair share of up-tempo, rip-roaring rockers on Dream Attic, the best of which, “Bad Again,” voices his surprise at his lady friend’s sudden mood change. Maybe you’ll love me in the morning. The rousing, witty songs, and those that feature drummer Michael Jerome’s heavily fortified and highly energized drumming, stand out on first listen, but much of the album is more intricate fare that requires attention and repeat listens to get the full effect. The tracks featuring Joel Zifkin on electric violin and long-time colleague Peter Zorn on saxophone are particularly well textured and layered. Thompson’s work has always rewarded careful scrutiny, and unlike those of many rock and rollers who have been around for a while but continue to perform decades-old material, Thompson’s musical faculties—lyrics, voice and guitar proficiency—continue to grow and improve. In the last dozen years or so, he has been trending toward making albums with more challenging and complex material—material that doesn’t easily fit in either the “rock” or “folk” categories for which he was best known. At the start of the decade, in honor of the millennium, Thompson put together a touring show where he covered a selection of his favorite music from the last thousand years, and in 2003 he put out a record of the show entitled 1000 Years of Popular Music. Exploring traditional music was nothing new for Thompson, whose first band, Fairport Convention, invented the notion of “folk rock,” but he also took on a wide variety of musical styles that were new to him. Jazz. Blues. Even Gilbert and Sullivan and other songs from early British musicals. Ever since the tour and the album, his own songwriting abilities have stretched, and while he remains faithful to his roots, he’s been wandering far afield with tunes that feel more mature than his earlier work. In 2005, he wrote and performed the soundtrack for Werner Herzog’s Grizzly Man. Last year, he composed a song cycle, Cabaret of Souls, in honor of his longtime friend and sometime bassist, Danny “No Relation” Thompson, who was being honored as the featured artist at the International Society of Bassists. Though a recording of the performance hasn’t been officially released, it appears that Thompson’s musical ambitions have taken on an almost theatrical scope. On his most recent release, the coupling of “Among the Gorse, Among the Grey” and “Haul Me Up” early in the album is full of real tension and drama. Like these, the best songs on Dream Attic have sweep and passion, as if, dare I say, they were outtakes from some kind of magnificent rock opera steeped in British musical traditions. 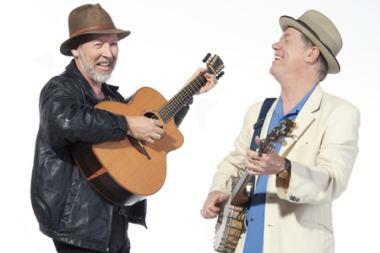 As hardy a musical feast as Richard Thompson offers these days, his appearance last October with Loudon Wainwright III was exhilarating in its return to basics—more of a ploughman’s lunch with a warm pint of ale than a multi-course banquet. Armed with a ukulele and an arsenal of his strongest songs in years, he attacked his set with humor and gusto. At times he threw himself so completely into his material that he took on the air of a Baptist minister, apoplectic with passion, his face contorted and tongue sticking out as he strummed. A fine guitarist in his own right, he kept things stripped back and straightforward, focusing on his spare songs about the twilight of the American middle class. Like the colleague with whom he shared the bill, Wainwright is a master at musically slitting his wrists with a smile on his face. After Wainwright’s acoustic set, Thompson took a turn, and he, too, offered a set that leaned more on heartfelt lyrics than technical pyrotechnics. Their final performance together, though too short, was the most compelling. As excited as I’ve been about Thompson’s Dream Attic, Wainwright’s material for this year’s 10 Songs for the New Depression left a more immediate impression on me. I’ve long been an admirer of popular music with a strong political bent, and recently I’ve puzzled at the relative scarcity of rabble-rousing tunes during this new dark age ushered in by the man the Supreme Court anointed president. With that pissed off look on Paul’s face. In the meantime, it’s a great comfort to have these two gentlemen keeping me company in these uncertain times.